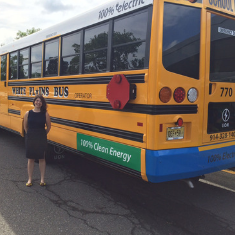 Caryn Laska provided Con Edison with public engagement and marketing strategies, including website improvements and implementation plans, to enhance public support of EV projects. Con Edison, a regulated utility provider to New York City and Westchester County, NY considers electric vehicles important to improve system efficiency and increase societal benefits. Its EV demonstration projects group had developed a series of pilot projects and hired EDF Climate Corps fellow Caryn Laska to help define marketing and public engagement strategies. Laska’s public engagement strategy targeted the platform with the greatest reach to consumers - Con Edison’s website. After developing a benchmark by comparing other Utility-EV websites she proposed new organization for existing content and additional content that would improve customer engagement and increase knowledge. She subsequently worked with the NY Department of Transportation to ensure support for ideas such as demonstration project filings and implementation plans that would impact customer acceptance of EV projects and infrastructure and a marketing strategy for a curbside charging filing. Laska also executed a market sizing activity for curbside charging stations with additional analysis to support placement decisions and created an analysis of passenger-mile transit investments that compared the impact of investing in electric public transport versus charging stations for individual vehicles. Laska’s contribution to Con Edison’s EV demonstration program has the potential to increase customer awareness of EV incentives and benefits, leading to a greater adoption of EVs in their service territory. Her analysis of charger placement, optimal investments, and research on the barriers to EV adoption provided Con Edison with the information needed to implement successful pilot programs. Caryn Laska is a dual degree MEM/MBA candidate at Duke University. Her experience as a consultant for gas and electric utilities clients has primed her for a career in energy. Laska is a cabinet member of the Fuqua MBA Food & Agriculture club, where she connects her career interests in both sustainable food systems and energy.